As of November 19th, I now only have one month left of my semester abroad in Sevilla, Spain, where I am currently attending the Universidad Pablo De Olavide. Looking back on my time so far, I can easily say that it has been the most amazing experience of my life. Over the past two months, I have done so many things that I never imagined would be doing one year ago while sitting in the College of Business contemplating my future at the University of Louisville. In only two and a half months abroad, I have visited three countries. I have gone to Paris, France twice, where I was able to take in the Eiffel Tower at night, and explore the largest art museum in the world, the Louvre. In Lagos, Portugal, I watched the sunset from what was once thought to be the â€œEnd of the World,â€ at the southernmost tip of Europe, and swam in the Mediterranean Sea. To top it all off, I have been able to do all of these things with my girlfriend, Meg Ryan, another U of L student, who is studying in France this semester. While it has been fun jet-setting across Europe, it is only natural that I have spent the majority of my time in Spain. Sevilla is located in the south of Spain in the province of Andalusia. The location has been perfect, allowing me to take numerous day or weekend trips all over the province. I have gone to Cadiz, where I went to the beach for a day, and Granada, where I spent the weekend discovering the famed Palace-Fortress known as the Alhambra. Whatâ€™s more, is that I have done all of this while living within a stoneâ€™s throw of both the third largest cathedral in the world, and the Royal Alcazar, a palace still used to this day by the King of Spain. Even though Spain is an industrialized country much like the United States, there are still plenty of differences between the two nations, outside of the language barrier, that make life in Sevilla quite the adventure. For example, there is no such thing as a 24 hour Wal-Mart, or grabbing a late night snack from Taco Bell. Almost every shop is closed by 12AM, except for the bars, where you can find Spaniards out until the early hours of the morning- everyday of the week! What about a McDonaldâ€™s breakfast? Forget about it. The grading system is also very different, relying on a 10 point scale, with 9-10 being an A, 8-9 being a B, 5-8 being a C, and 0-5 being a failing grade. Internet access is also severely limited, forcing me to rely on cafes, and making it difficult to keep in touch with friends and family back home. Not only this, but the entire city shuts down for 2.5 hours during peak business times for an afternoon, â€œSiesta!â€™ While it is sometimes inconvenient that many of the amenities that I have grown used to in the States arenâ€™t available, they are all things that I can do without. In the end, discovering the many nuances of Spanish culture are what keeps life interesting, teaching me to react on the fly and to expect the unexpected. Other than my family and friends, what I have missed most about being home is the food. My Senora takes really good care of me, making me three course meals two times each day, but as tasty as Spanish food is, there is nothing quite like some good old-fashioned home cooking. I am really looking forward to coming home and having some of my momâ€™s lasagna, and any type of breakfast food, since I have not had breakfast since I have been here. Not only that, but if any of you have ever been to Northern Kentucky, you should know that we love our skyline chili, and my favorite pizza, LaRosaâ€™s. Despite all of the things that Iâ€™ve already been able to accomplish, I am excited to see what else study abroad has in store for me. In December, I have a big eight day trip planned to London, Amsterdam, and Berlin. I cannot wait to have that week off of school and to explore some of the most amazing cities in the world. I have loved my time here in Spain, and cannot believe that in just a few weeks it will all be over and I will be heading back to Kentucky. As sad as it will be to leave, I look forward to being back at U of L for the spring semester. See you all soon! 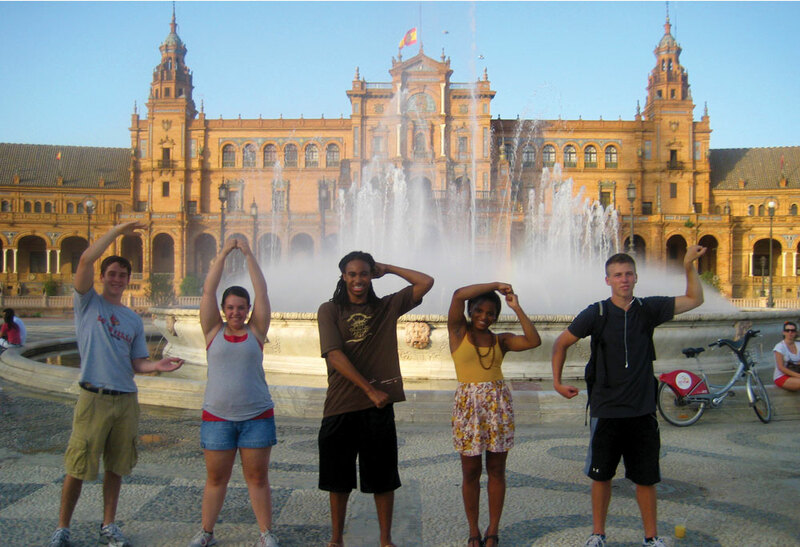 This entry was posted in Study Abroad by cjgroe01. Bookmark the permalink.